This weekend I received some news that made me highly excited. I was told that there is Superman ice cream in Northern Virginia. What the eff is Superman ice cream you ask? It has nothing to do the actual Superman or DC Comics. Just that the colors are blue, yellow, and red like Superman’s colors. Now that I think about it would be fitting that my favorite flavor of ice cream is geek related. I first discovered this wondrous creation in a small ice cream shop in southwest Virginia several years ago. Normally I usually go for cookie dough ice cream or cookies and cream. But that fateful day, I decided to try something new and went with this multicolored ice cream without having any idea how it tasted. It’s really hard to describe how it tastes other than FREAKIN AWESOME. Some people say it’s just vanilla in three different colors. Others say it’s three types of fruity flavors such as strawberry, banana (or lemon) and Blue Moon (no, not the beer). I say that it’s something you have to try for yourself. You may not like it (all those artificial colors, I know) but I think it’s just delicious. Anyways, other than that one ice cream shop, the only other place I’ve been able to find it was at a ski resort in western Maryland. I was not expecting to find it and of course, I’m the weird person who was geeked to eat ice cream in freezing weather. As it’s originally from Michigan and normally a Midwest thing, it’s nowhere to be found in stores or in any other local ice cream place I’ve been to. Every time I traveled for work, I would search in vain hoping that maybe one place would have it. Now that I’ve received rumors that Superman ice cream is somewhat nearby this is the current dilemma. According to Google maps, the place that sells this ice cream is 20 miles away so it’s a 40 mile round trip. How much do I love this ice cream? Is it worth the trip? So many factors to consider. Do I need to be in this area for anything else? How much is the ice cream? Can take home quantities be bought? Do they even have it in stock? Will it taste as good as I remembered it? Can I convince anyone to go out and get it with me? 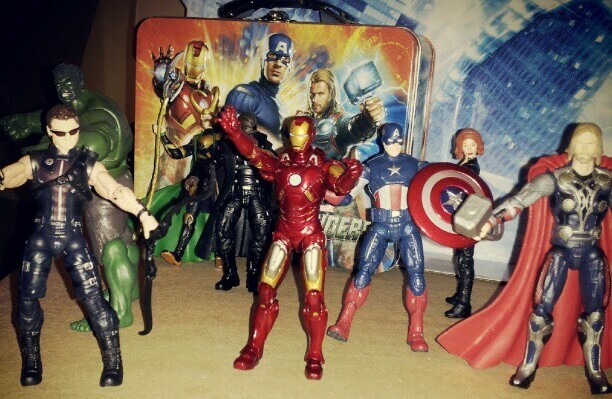 Do I feel geeky? This is going to be a to be continued post. I will try to see if I can make it sometime during the summer. The original place I found it was at a small country ice cream store in Damascus, Virginia called “Off the Beaten Path” right off the VA creeper trail. The rumor is that Kalidescoops in Alexandria, VA has it too but I have not been able to confirm this yet. Hi Deborah, I found your website researching Superman. We make our own ice cream and I’ve had requests for Superman. I’ve never tasted it myself, but we put together our own concoction of banana, lemon, strawberry and raspberry. We are located in Fort Henry Mall in Kingsport in NE TN. If you are passing through the area, stop by. Thanks for letting me know! It’s been a few years since I’ve been in that part of TN but if I I ever stop by, I will DEFINITELY try that out! 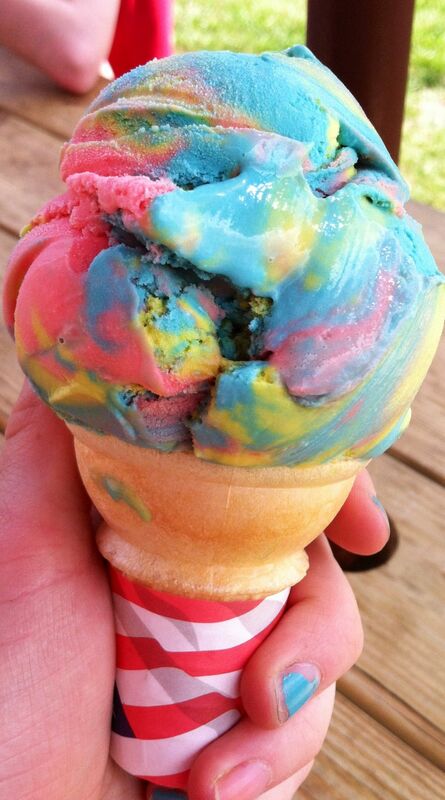 Superman ice cream was my favorite when I was a kid in Ohio. There was only one place, a local dairy-queen type place, that had it. 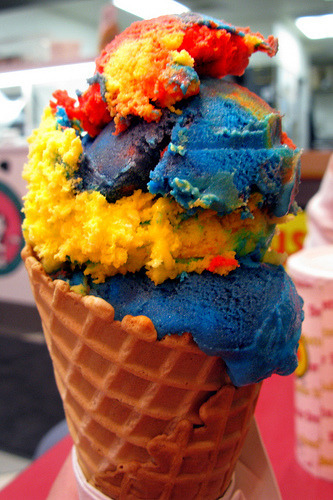 When I went off to college, they changed to a different kind of superman ice cream. It was made of more pastel colors than the bold royal blue, sunshine yellow, and dark pink. I was so disappointed when I discovered this. Since graduating college, I moved to Chicago. 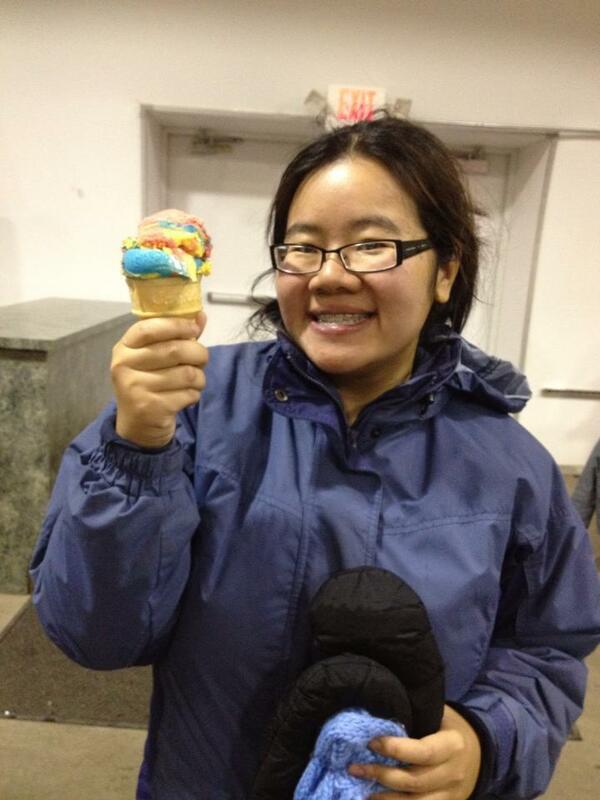 A few years after living in the city, I finally found my favorite flavor again… the ORIGINAL superman ice cream. It’s at Windy City Sweets 3308 N. Broadway Chicago IL,60657. It took me 17 years!!! 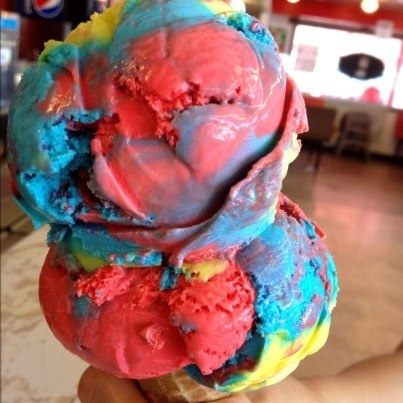 There are all kinds of “superman” ice creams out there. But none are anywhere near as delicious and unique as this. 🙂 My attempt to describe the flavor… blue moon and vanilla. It’s not fruity in my opinion. If you can ask Windy City how they make blue moon, we’ll incorporate it at our shop. We are big on authenticity, but making it fruity seemed like a good compromise and better than serving up vanilla in 3 colors. For anyone still looking, I went to the Kirwins @ Waugh Chapel near Bowie MD on 10/15/16 and they had Superman ice cream available, as well as Blue Moon, Mackinac Island Fudge, and other flavors. Its fairly expensive as ice cream goes, but Kirwins might be the most straightforward way to find it in the DC area.